Piazza del Campo. Travel Theme: Meeting Places. A Piazza is the quintessential meeting place. It is interesting to reflect upon the role of the Piazza in Italian history; meeting place, site of political unrest, market place, home to festivals and sagre as well as musical and theatrical events, the piazza plays a central role in the communal life of all Italians today. It is a stage, a living theatre. 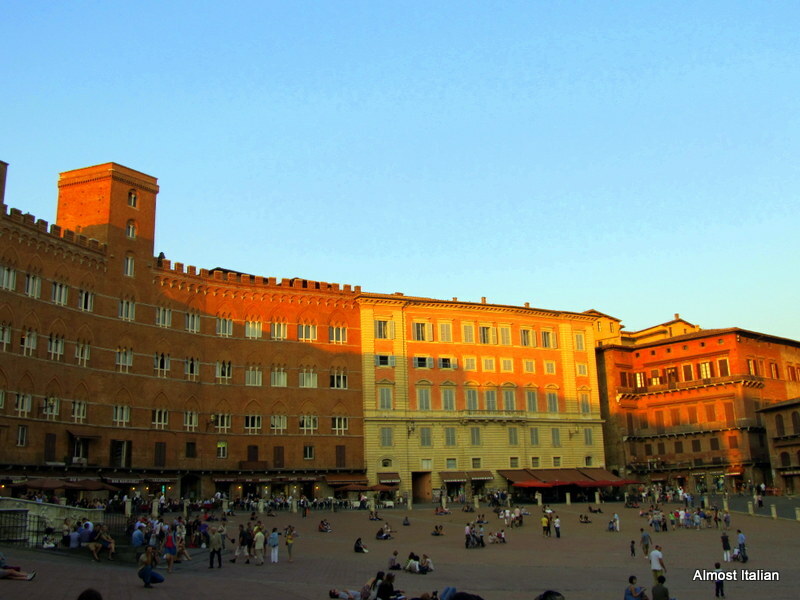 Piazza del Campo in Siena is my favorite meeting place. Watch as old be-suited gentlemen meet for a coffee, a smoke or to pick up the La Repubblica newspaper at 7 am. See the noisy teenagers gather after school at around 1.30 pm; at 5pm, another wave of older college students descend on ‘Il Campo’. They lie about in the setting sun or chat in huddled groups. Locals converge after dinner for passeggiata on the way home. In winter, they stroll in long fur edged coats and fine shoes, appearing to glide across the uneven bricks, reminding me of the wealthy citizens depicted by Ambrogio Lorenzetti, famous painter of Sienese life in the 14th century. The best time to visit Siena is out of season when Piazza del Campo becomes moody and mysterious under the winter sky. Avoid the summer months, especially during the Palio, as well as Easter, unless you fancy hordes of people. See Ailsa’s Where’s My Backpack for other meeting places around the world. I have been to New York in July!!! It is busy. Off season travel anywhere is the best. Welcome back after your stressful pre flight issues. A perfect choice, Francesca! It’s such a luxurious expanse, amid the density of the city. I loved how the sweep of the contoured paving, like a wave, or a fan unfurling, seemed to make it fluid – not a not static space. I must say, though, I wouldn’t mind being there for the exuberance of Palio, or Easter, to see it as it might have been during the Renaissance. I agree regarding the Palio- exciting. But during the Renaissance, the population was so small, and there weren’t any tourists. The plague visited this area twice, wiping out a considerable proportion of the population too. I have been there once during Easter. It was awful and nearly spoilt all my memories of this beautiful town. Bus loads arrive non stop- from every part of europe and Italy itself. Every trattoria is over stretched and teh food becomes common place. The piazza itself is a sea of people. Easter is a week long event in Italy and so it can be the busiest time of the year. It is safe to visit from October through to about March, to keep Renaissance fantasies alive. Our urban spaces are becoming more communal and used in places like Brunswick and Richmond. I think this trend is slowly emerging. But then, our shire councils often require permits for all sorts of things- imagine setting up a big communal risotto feast in one of our small parks, or a band, or a political protest, without the council going haywire. Looks like a wonderful spot to congregate. Perfect for the theme! Ohh gorgeous photos and such an amazing city! I wish life was more laid back like that in Melbourne..
Melbourne is pretty coo too. I like Fed sqaure and it reminds me of Piazza del Campo. Great post. I love the Piazza del Campo, but the last time I was there it was spoiled by too many tourists rushing from one place to the other. They missed the whole point of the piazza – a relaxed place to gather, chat, have a drink, see and be seen (particularly during the evening passeggiata). There are also places like this in every Greek town – called plateias – essential urban spaces where the community comes together, though the architecture of Siena is much more spectacular! Tourists can really spoil a good Piazza ( of course that excludes you and me,haha.). I agree, Some busloads of folk just run about and tick off the boxes, join the queue in the tower, eat a bad touristy pizza, then run back to the bus, believing that they have visited Siena. Siena takes months to unfold- walking the back streets and getting lost, visiting all the local churches which are often more inspiring than the famous ones. listening to the youth of the ‘Contrade’ meet in rooms to plan events or socialise, going to ‘Il Forno’ for a daily hit of foccaccia dripping with oil and salt, straight from the oven, wandering through the market….. Oh how much I love Siena, let me count the ways. One never includes one’s self in the category of tourist. A fallacy, but a nice one. I hate rushing from one place to another. And, I love Siena. Worked on an excavation just south of there early in the 1980s. Loved the whole experience. No we aren’t tourists, we’re travellers. Must have been a great experience working there. My time there was spent as a student. Now that you mention it, I once wrote a paper on early 19th century travel to Greece that made that distinction between traveller and tourist. Yes, we’re travellers. I like that! Their wives are probably happy to see the back of them! They do also gather and chat- at markets and so on. Women tend to be a busier and more productive lot, speaking as one of them. Ah, Thanks. Now if you hapen to read Italian, and love piazzas, read this- it is really interesting. Ahhh read the first part of this and enjoying it already. Now back to my italian homework and I’ll read the rest of it later! Thanks so much! The last time I had the chance to be there was 3 years ago, a sunny Sunday in January. Thanks a lot Francesca for this post, you made me remember how much I love my country. A sunday in January in Siena- how perfect. I love your country too. And yet another trip down memory lane for me! We stayed in Tuscany for a week (Gaiole in Chianti) and Siena was the closest town/city. One of my favourite photos is Mr Tiffin and my brother walking down the steep cobbles, heading towards the piazza, chatting to each other. Really enjoying these pieces Francesca. Ah Thank you kindly. Siena, and the little towns nearby, stay with you forever. I can see that photo in mind. I am so glad you had the time to sit on the stones and watch the world go by. Love Siena. I have been a few times, including two weeks studying Italian there. Wonderful city. I must admit that the first part of this post, regarding the role of the piazza in Italian history, is something I translated from an Italian history. I spent a lot of time in Siena as a student and living there for a time, came to love the Piazza in all its different moods. Thanks for dropping by.